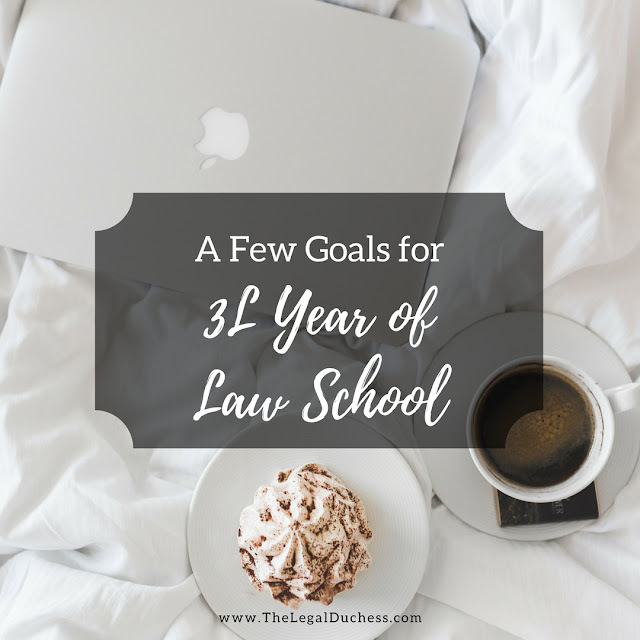 I start my 3L year in just 14 days so I am sitting down to lay out some goals. I think it is important to always set some goals in place when entering a new phase or semester. When I set goals, I try to make sure they are achievable. For my 3L year, I am setting 6 simple but important goals. This one is a biggie... I really hope to have a job lined up before graduating. I am going to spend a lot of time looking for good jobs and applying. I know the job market is very competitive and I am just crossing my fingers that the right door opens to me. My GPA has been on a steady rise since my rough first semester. My GPA in Spring 2018 was my highest to date along with securing the highest grade in one of my classes. I plan to work hard and continue this upward trend. In a perfect world, I would love to make Dean's List one semester but I am trying to stay realistic. I will be happy with any increase in my GPA throughout my last year. I try really hard to maintain good health and fitness while in law school. I have been running, doing Yoga and Tone It Up workouts throughout. This year, I want to set my sights on a 5K and work up to it. I think having a date and race to work toward will help keep me on track with my fitness and health throughout the stress of law school. I have made some absolutely amazing friends in law school. As we head into our last year and everyone had different plans and goals for after, one thing I really want to work toward is lasting friendships with these people. I want these to be friendships that survive the end of law school and everyone going their separate ways. Throughout my 3L year, one of my goals is maintaining and strengthening those friendships so that they do last past graduation day. So I have a free bar study course set up because I have been a student representative for the company during law school. However, it is still going to be a long period of time with no income. I am blessed with a supportive husband who takes care of me but I want to save money to make the time I am studying for the bar financially easier for us. I will be eating out limitedly and avoiding online shopping as much as I can this year in order to save up! This is my last year as a student before I have to be a real adult. My goal is to make the most of it! I am going to get coffee in the middle of the day, sleep in on random Wednesday's, wear sweatpants on weekdays and live it up as a student for the last time. This will be my 20th consecutive year of school and though I am ready to be done, I am also going to enjoy every minute to the fullest extent that I can. What are your goals for the new school year? Hi, I just graduated. Try not to freak out TOO much about finding a job. Many, many jobs require that you have already at least sat for the bar. Furthermore, the smaller firms won't necessarily know of their need a year out. It's hard when you see everyone come back from 2L summer with jobs, but I promise it all works out. Best of luck. Hi Mandy! Thank you- that makes me feel a lot better. I want to work in the criminal law field and I know that means I will probably get a job later than many of my friends. But you are right, everything works out in the end!